This article explains how to transfer data from Excel to Oracle Sales Cloud using the Excel Add-In for Oracle Sales Cloud. The CData Excel Add-In for Oracle Sales Cloud enables you to edit and save Oracle Sales Cloud data directly from Excel. This article explains how to transfer data from Excel to Oracle Sales Cloud. This technique is useful if you want to work on Oracle Sales Cloud data in Excel and update changes, or if you have a whole spreadsheet you want to import into Oracle Sales Cloud. In this example, you will use the Opportunities table; however, the same process will work for any table that can be retrieved by the CData Excel Add-In. If you have not already done so, create a new Oracle Sales Cloud connection by clicking From Oracle Sales Cloud on the ribbon. Username: Set this to the user name that you use to log into your Oracle Cloud service. Password: Set this to your password. HostURL: Set this to the Web address (URL) of your Oracle Cloud service. To insert data into Oracle Sales Cloud, you will first need to retrieve data from the Oracle Sales Cloud table you want to add to. This links the Excel spreadsheet to the Oracle Sales Cloud table selected: After you retrieve data, any changes you make to the data are highlighted in red. Click the From Oracle Sales Cloud button on the CData ribbon. The Data Selection wizard is displayed. In the Table or View menu, select the Opportunities table. In the Maximum Rows menu, select the number of rows you want to retrieve. If you want to insert rows, you need to retrieve only one row. 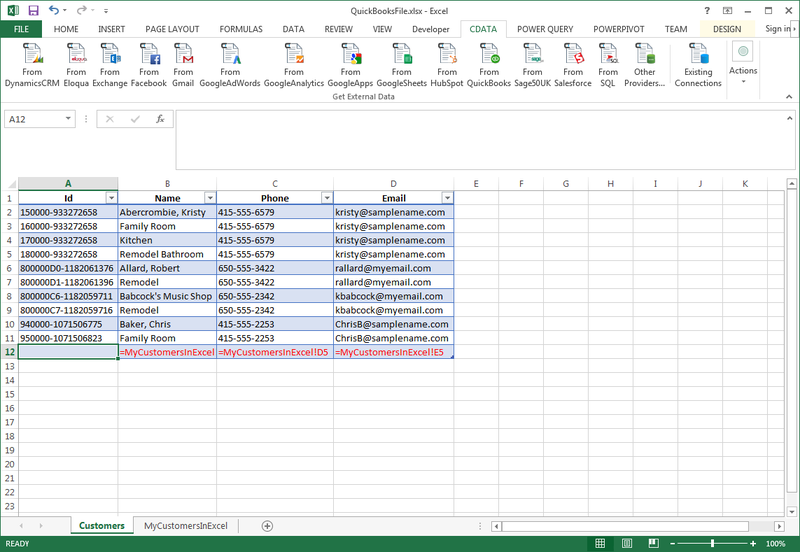 The Query box will then display the SQL query that corresponds to your request. In the Sheet Name box, enter the name for the sheet that will be populated. By default the add-in will create a new sheet with the name of the table. 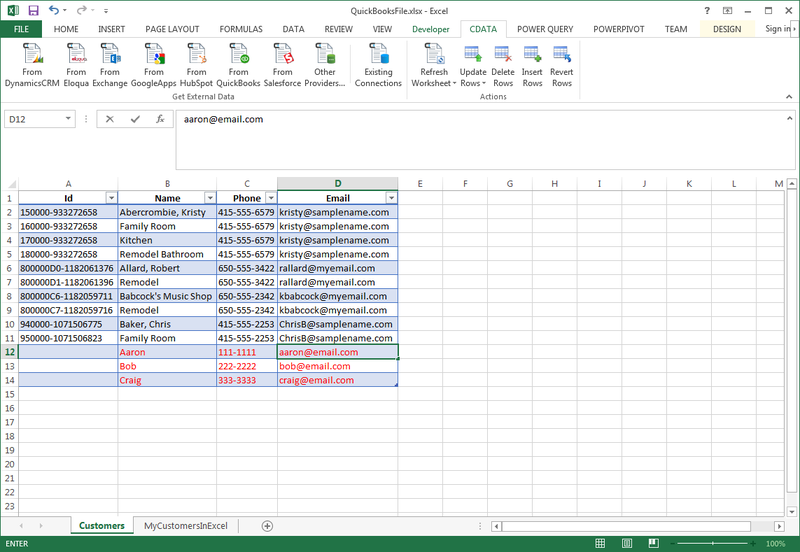 After retrieving data, you can add data from an existing spreadsheet in Excel. 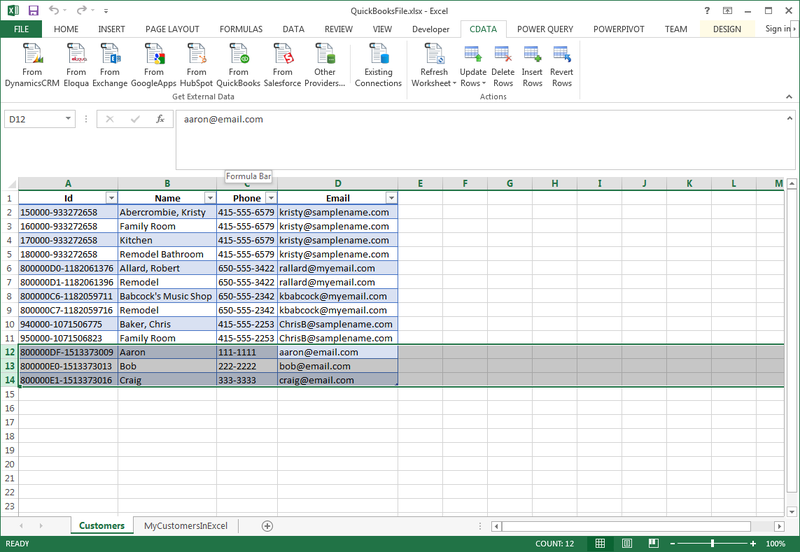 In a cell after the last row, enter a formula referencing the corresponding cell from the other spreadsheet; for example, =MyOpportunitiesSheetInExcel!A1. After using a formula to reference the cells you want to add to Oracle Sales Cloud, select the cells that you are inserting data into and drag the formula down as far as needed. The referenced values you want to add will be displayed on the Opportunities sheet. Highlight the rows you want to insert and click the Insert Rows button. As each row is inserted, the Id value will appear in the Id column and the row's text will change to black, indicating that the record has been inserted.